Just as it is difficult to sort out the biological effects of the 1982-83 El Niño along the Pacific Northwest coast, so it is difficult to determine the socioeconomic impacts. A cursory analysis, focusing only on the fortunes of commercial salmon trollers and charter-boat operators along the Washington, Oregon, and California coasts might conclude that the El Niño had nothing but deleterious impacts. Yet, Alaskan salmon harvesters and con sumers of salmon fared quite well during this period. While the specific effect of the El Niño on the Alaskan harvest, as opposed to other factors, is an unresolved question, it is clear that a different picture is obtained by taking a broad rather than a narrow view of the northeastern Pacific salmon fishery during the El Niño period. From the harvest figures presented in Table 4.3, it can be readily inferred that the impacts of El Niño were highly uneven. While Alaskan harvests continued to increase, harvesters targeting the stocks of coho and chinook along the coasts of Washington, Oregon, and California were hard hit. In Washington, northern Puget Sound purse seiners and gillnetters were also hurt by the reduced availability of Fraser River sockeye. For commercial trollers from Washington southward, 1983 was a very bad year. Not only were harvests of their primary target species (coho and chinook) down sharply from already depressed levels, but the prices that they received for the harvest fell to their lowest level in many years. The combination of a small harvest and low prices caused the real ex-vessel value of the troll harvest to plummet in all three states (see Table 4.3). While conditions improved the following year in California, for trollers in Washington and Oregon, 1984 conditions were much worse. This was the case despite the fact that, in both states, the harvests of coho and chinook by other commercial gears increased slightly in 1984. The change in the 1984 distribution of the harvest between trollers and other commercial gears (see Figs. 4.8 and 4.9) can be traced to very restrictive ocean fishing regulations put in place by the PFMC in an effort to prevent overharvesting of stocks weakened by the 1982-83 El Niño, one of the biggest in a century. Fig. 4.8 Troll as a proportion of Washington commercial salmon harvest. For these reasons, variations in the harvest of coho or chinook in Washington, Oregon, or California, such as those occasionally associated with the El Niño, appear to have virtually no influence on the average prices received by the harvesters.! Since the prices received by west coast trollers are not influenced by fluctuations in local harvests, the harvesters are vulnerable to declines in externally determined prices occurring in conjunction with poor harvests. This is exactly what happened in 1983. Measured in constant 1988 US dollars, the real ex-vessel price of coho harvested in the Oregon troll fishery fell to its lowest level since 1971, while the price for chinook was the lowest since 1975 (PFMC, 1989). The low prices in Oregon may have been partly a result of the small size and poor condition of the salmon harvested there, but the US average prices of coho, chinook, and of the total salmon harvest were also unusually low that year (National Marine Fisheries Service, 1988, 1989). However, the problem of depressed earnings in the coastal salmon troll fishery did not begin in 1983. As the total harvest of coho and chinook in these three states expanded over the course of the 1960s and early 1970s, so did participation in the troll fishery. This unrestricted increase in effort resulted in declining earnings per vessel despite large harvests and increasing real salmon prices. In California, for example, the number of commercial salmon trollers peaked in 1978 at 4,919 (PFMC, 1989). At that time, the size of the fleet had more than doubled since 1972, when 2,392 troll vessels landed commercial salmon in California. In 1960, there had been only 1,365 vessels in the fleet. When California's total commercial salmon harvest reached its alltime peak in 1976, the number of pounds landed was double that coho: Alaskan and Oregon harvests = —0.348; Alaskan and California harvests = —0.389. All of these coefficients are significant at the 95% level of confidence or better. 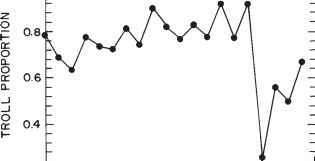 t Regression analysis performed by authors. It was found, for example, that variations in real ex-vessel coho prices received by Oregon trollers bore no statistically significant relationship to variations in either Oregon's coho harvest or to coho harvests elsewhere along the coast. This suggests that other products, including other salmon species, are viewed by the market as good substitutes for coho. landed in 1960. Even so, and even though the real average price of the fish had increased by US$.64/lb - US$1.41/kg (in 1988 US dollars), real gross annual earnings per vessel had dropped from US$9,048 to US$5,829. The declining coho runs and the collapse of the chinook run in 1983 caused real gross earnings per vessel to drop further to US$1,680. A large number of vessels dropped out of the California troll fishery that year (see Table 4.3), and there were many foreclosures on mortgaged vessels (Bathgate, 1984). In the wake of the El Niño, active participation in California's commercial troll fishery appears to have been permanently reduced. In Washington and Oregon, the troll harvest peaked both in terms of numbers of salmon and real value in 1976. As in California, participation in the troll fishery expanded in response to the high total value of the harvest. After 1979, the earnings of Washington and Oregon trollers decreased rapidly due to a combination of falling prices and reduced harvests. When the effects of the El Niño were felt in 1983, they had already experienced three straight years of relatively disappointing earnings. Recent entrants to the industry who had borrowed money to acquire their vessels may, therefore, already have been in a vulnerable financial position. Concern about "overcapitalization" and resulting low harvester income was a major driving force behind the establishment of limited-entry programs in all of the coastal states. The goal of promoting more effective biological management may also have been a very important driving force. During the late 1970s, the Pacific Fishery Management Council issued a recommendation urging all Pacific Coast states to limit entry into the salmon fishery (Huppert & Odemar, 1986). Washington's limited-entry program had the additional goal of assisting the state in enforcing the terms of the 1974 Boldt decision, which guaranteed Indian treaty rights to take half the salmon that would have naturally returned to the traditional Indian fishing grounds in the absence of interception by other harvesters. Since trollers are generally fishing on mixed stocks and "in-front" of the traditional Indian fishing gears and areas, trolling was targeted early for reduction as part of the effort to comply with the Boldt decree. A moratorium on new troll licenses was instituted in 1976, followed by increasingly stringent gear restrictions and a vessel buy-back program, that ended in 1986 (Jelvik, 1986). The division of the salmon harvest between Washington's Indian and non-Indian commercial harvesters seems to have been worked out just immediately prior to the El Niño. 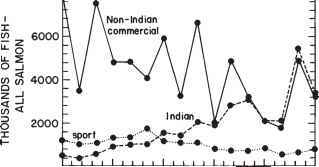 In terms of total numbers of salmon, the Indian harvest first reached parity with the non-Indian commercial harvest in 1980, and from 1982 onward, the division appears to be virtually 50-50 (see Fig. 4.10). 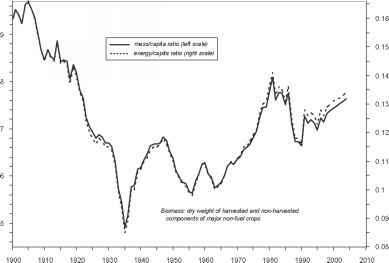 After peaking in 1976, the share of Washington's salmon harvest taken in the troll fishery declined steadily to a low in 1984 (see Fig. 4.8), when the combined effects of the El Niño and of ongoing efforts to reduce the troll fishery resulted in a troll harvest of only 97,000 salmon (down from more than 1.7 million salmon in 1976). It is somewhat ironic that coho and chinook were the species most seriously affected by the El Niño, since they are the most important to the already stressed troll fishery. For Washington trollers, the distress caused by the El Niño was apparently compounded by ongoing regulatory changes. In California, a moratorium on salmon troll permits went into effect in 1980 followed by a limited-entry program in 1982. This program allowed a large number of historically active vessels to remain licensed and included no buy-back or other directed fleet reduction program. Therefore, the subsequent reductions in fleet size can be attributed to the effects of reduced run sizes, low salmon prices, and increasingly restrictive fishing regulations (Huppert & Odemar, 1986). In Oregon, participation in the troll fishery peaked in 1980 when, according to the PFMC (1989), "The establishment of a restricted vessel permit system drew a number of historically active vessels back into the fishery...". As in California and Washington, the number of active salmon trailers in Oregon has been much smaller in the post-El Nino period than just prior to this event (see Fig. 4.9 for the proportion of the Oregon commercial harvest taken by trailers). The number of troll vessels participating in the Washington, Oregon, and California commercial salmon fishery peaked shortly after total coho and chinook harvests peaked in the mid-1970s. The subsequent period of lower harvests seems to be associated with lower participation, but the fact that limited-entry programs were instituted over this period makes it difficult to interpret the cause of this trend. Only 1984 stands out clearly as a season when large numbers of Washington and Oregon trailers chose not to fish as a consequence of poor runs and the resulting reduction in the fishing season. Emergency changes in state regulations that year (PFMC, 1989) made it possible for trailers to sit out the season without risking the loss of their permits. The movement of vessels into and out of the coastal salmon troll fishery in response to fluctuating returns can be seen as a socioeconomic response to the inherent variability of this fishery. This response has perhaps been facilitated by the fact that the capital requirements for commercial trolling are quite modest, and since most of the coastal spawning runs occur in the summer, trailers have traditionally included many part-time participants who pursue other occupations as their primary source of income. Those trailers who derive most of their income from fishing may also fish for crab, tuna, or bottom-fish. The available data on participation indicate that the coastwide reduction in the number of troll vessels over the past decade cuts fairly evenly across all vessel size classes (PFMC, 1989). This suggests that owners of small vessels, many of whom may have been part-timers, were no more likely to be "marginal," in an economic sense, than the owners of larger vessels. Although the total coastwide commercial salmon harvest was at near record levels in 1983 and 1984, from the narrower perspective of salmon fishing interests in Washington, Oregon and California, those years were viewed as disastrous. As has been previously shown, the El Niño-related reductions in salmon availability were not the sole cause of the distress experienced by salmon harvesters and related enterprises. Nevertheless, the possibility of obtaining federal disaster assistance from the US Small Business Administration's (SBA's) Economic Injury Disaster Loan Program led these interests to emphasize El Niño as the primary cause of their distress and to call on the governors of their states to declare the event a natural disaster. Governors of the Pacific coast states made disaster declarations and requested federal assistance in late 1983. Washington Governor Spellman's declaration stated that: "Economic hardship has been severe among the salmon and crab fishermen and processors, but a broad range of marine related businesses such as equipment suppliers, shipyards, repair shops, retail stores and hotels also face economic problems due to the devastated fishing industry which normally supports their business" (letter from Governor Spellman of Washington to Regional Administrator, Small Business Administration, S.J. Hall, 23 November 1983). SBA recognized that salmon harvests were substantially below average. However, the SBA initially denied the designations of emergency, arguing that: "The atmospheric or weather condition known as "El Niño" does not of itself constitute a physical disaster" (J.C. Sanders, Administrator of Disaster Assistance Division of the Small Business Administration, telegraphic message to Governor Spellman, 8 December 1983). El Niño is an "atmospheric condition ... not conducive to the operations of a certain type of business," but the possibility of such conditions "constitutefs] part of the risk of being in business" (Rocky Mountain News, 1984). Fishing interests were dissatisfied with this response, and questioned why farmers were eligible for disaster assistance during droughts but not fishing interests affected by a similar short-term condition. Pointing to the fact that the US Agency for International Development had provided approximately US$100 million in disaster aid to South American countries affected by El Niño, they turned to their Congressional delegations for assistance. Under continued pressure from Congress, the SBA reversed its decision on the disaster declaration in late September 1984, making low interest loans (4% for up to US$500,000) available to fishing-related businesses (The Seattle Times, 1984b). SBA was thus forced to provide assistance despite the agency's serious mis givings about the financial health of the industry and the ability of the borrowers to repay the loans even under normal conditions. The agency was also concerned about setting a precedent of becoming a banker for weather-sensitive businesses. For SBA, the losses were part of doing business in fisheries, analogous to losses incurred by a ski resort operator without snow or a beach resort with no sun. Some years are bad, but others may be very good. The program loaned approximately US$28 million, in a total of 319 loans, to west coast fishing firms. However, given the delay in availability of funds, many individuals had already defaulted on loans and lost vessels and collateral and had suffered other personal damages (The Seattle Times, 1984a,b). Although salmon harvesters had been instrumental in gaining implementation of the program, its biggest beneficiaries were Bering Sea crab fishing firms. The final decision to provide assistance was not the result of an objective analysis of the situation. Rather, it was the result of pressure from local politicians responding to a powerful and highly visible natural-resource-based interest group. In retrospect, this episode provides a microcosm of issues surrounding efforts to come to grips with global climate change issues. There is enormous uncertainty surrounding the assessment of climate impacts, particularly in the case of a fishery. SBA was not prepared to perform such an assessment, since the agency was unaccustomed to dealing with climate-related biological impacts on fisheries and did not have a staff of oceanographers and biologists to provide technical advice. As should be clear from the previous discussion, it would be extremely difficult and probably prohibitively costly to determine accurately the level of the biological impacts of an event like an El Nino and to further determine the socioeconomic effects directly and solely attributable to those impacts. This suggests that governmental decisions to allocate public funds for assistance are likely to continue to be made largely on a political basis. Consumers of salmon were largely unaffected by the reduced harvests of coho and chinook in Washington, Oregon, and California during 1983 and 1984. The Alaskan salmon industry had been moving strongly away from canning and into the fresh and frozen market for several years before the El Niño event (Department of Agricultural and Resource Economics, Oregon State University, 1978). This fact, coupled with the rapid growth in Alaskan harvests simply overwhelmed the effects of reduced coastal coho and chinook harvests in the retail market for fresh and frozen salmon. There may, however, have been some adverse effects on consumers in certain sub-markets. For example, large troll-caught chinook and coho (as opposed to net-caught) are especially desired for the production of smoked salmon. The reduced availability of these particular salmon may therefore have affected consumers in that market. While processors were reported to be adversely affected by the El Niño, their operations are often well designed to deal with fluctuating harvests. Many deal with the problem of biological variability by diversifying across a wide variety of species. As seasons may be short for any given species, diversification allows a more complete utilization of processing capital. Processors may also structure their buying arrangements to promote harvester loyalty and insure a more even utilization of processing capacity. For example, season-end bonus payments are commonly used, and a purchase agreement for salmon may also bind the harvester to sell that year's crab harvest to the same processor. The salmon sport fishery was also affected by the El Niño and resulting changes in fishing regulations, particularly in 1984 in Washington. The Washington sport harvests of coho and chinook actually increased slightly in 1983, relative to 1982, but then dipped in 1984 when season restrictions caused a sharp drop in the number of charter-boat trips and, therefore, in revenues for those businesses. Reduced harvester incomes and poor salmon sport fishing seasons undoubtedly had adverse economic impacts on a number of coastal communities. The magnitude of those impacts would, however, be very difficult to determine, particularly since this was a period of general economic recession, with high unemployment rates also in the locally important lumber industry. Several conclusions can be drawn from this case study that shed light on the potential biological and socioeconomic impacts of global climate change. First, this case study demonstrates that both the biological and socioeconomic impacts of climatic variability are very complex and, at present, poorly understood. Salmon stocks in the northeastern Pacific appear to be affected by both short-term ocean-climate events such as El Niño and by longer-term variations in patterns of sea surface temperatures, upwelling, and primary productivity. However, little is known about the exact nature of the impacts of the ocean environment on salmon. Salmon abundance may also be affected by changes in runoff patterns in spawning streams, and the effects of changes in ocean circulation patterns and salinity levels are unknown. The interactions between climate-related ocean conditions and salmon abundance are so complex that there has been a tendency to view the ocean as a "black box." However, there has been recent research progress in this area. Although some observers debate the value of additional research and of improved monitoring of oceanic and other environmental conditions for annual management purposes (Walters & Collie, 1988), such efforts may improve our understanding of the effects of long-term climate changes. The socioeconomic effects of variations in salmon abundance are also complex. The impacts in any given region are intertwined with the effects of changing salmon abundance elsewhere, as well as with the effects of changing market conditions and regulatory programs. It has been shown that the apparent biological effects of the 1982-83 El Niño were highly uneven, and that this unevenness exacerbated the impacts of the event on those harvesters relying on adversely affected stocks. This suggests that climate change will, likewise, have uneven impacts. While individuals in one region may lose as a result of climate change, there may be winners elsewhere. It is easy to misconstrue the net socioeconomic effects of climatic events or of projected climate changes if one focuses only on adversely affected regions, or if the market effects of expanding output in other regions are misunderstood. This complexity suggests that, even as they occur, the impacts of global climate change on fisheries may be far from obvious. This should lead us to be wary of facile conclusions drawn about the anticipated impacts of global climate change. This can also be seen as an argument in favor of improving our base of research on climate impacts. We can have little hope of correctly anticipating the effects of potential climate changes without an improved understanding of the interactions between climate, biological processes, and the socioeconomic activities dependent on those processes. The El Niño period described in this case study gives us a glimpse of the kinds of biological and socioeconomic effects that may accompany the increased frequency of previously unusual climatic conditions. A change in the relative frequency of various climatic extremes is one of the potential effects of C02/trace gas-induced climate change (Mearns et al., 1984). With limited scientific and managerial resources, little attention is generally given to the potential effects of rare events until such an event occurs. At that time, both the scientific and managerial responses may, of necessity, be ad hoc. A conclusion that can be drawn from the El Niño experience is that the scientific understanding of the impacts of an El Niño event on salmon was so fragmentary and uncertain that there was little basis upon which to make stock predictions for management purposes. In 1983, this left salmon management largely unprepared for the reduced abundance and poor condition of Washington, Oregon, and California coho and chinook stocks and for the altered migration pattern of Eraser River sockeye. In 1984, the conservative strategy adopted by the Pacific Fisheries Management Council resulted in a severely diminished coastal troll fishery, while harvests improved for operators of other gears. This suggests that efforts to equitably balance in-season harvest allocations among competing gears are unlikely to succeed when managers are confronted with conditions outside their range of recent experience. Since climate change may increase the frequency with which resource managers confront unusual climate-related conditions, this case suggests that it may be valuable to devote increased attention to anticipating the effects of currently unusual climate-related conditions and to planning response strategies. While it is certainly possible to "muddle through" such periods, the El Niño experience suggests that reliance on this approach may have undesirable consequences such as an increased potential for resource damage or inequity in harvest allocation. The longer-term effects of interannual variability in marine conditions on the salmon fishery and socioeconomic adaptations to this variability are also of interest to those concerned with the potential impacts of global warming. Variability will continue to be an inherent feature of climate, although ranges of variability may change. In the case of the salmon fishery, harvesters, processors, managers, and markets have already adapted to an enormous amount of interannual variability. These adaptations to current variability imply that similar socioeconomic adjustments will be made to the effects of a changing climate. Since adaptations to current variability may provide the avenues for adjustments to climate change, it will be increasingly valuable to understand where they do and do not work well.